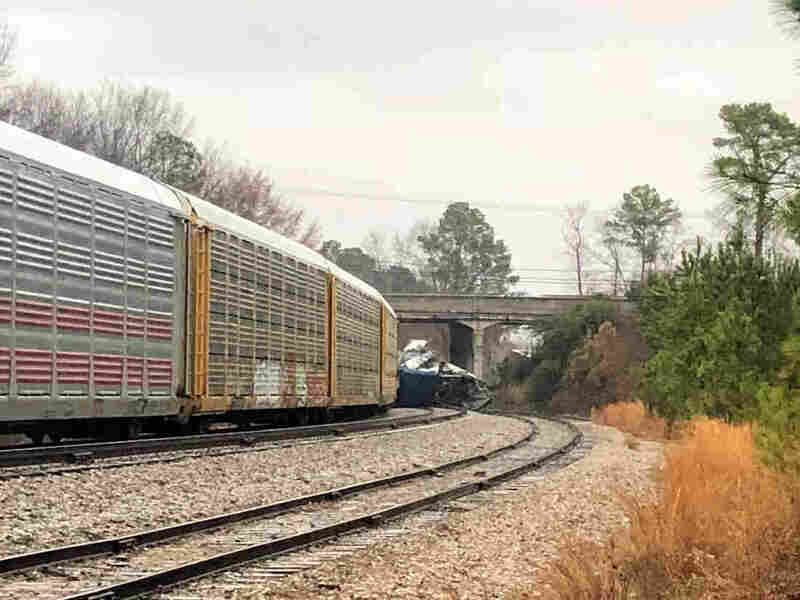 At Least 2 Killed, More Than 100 Injured After Amtrak Train Derails In South Carolina : The Two-Way An Amtrak passenger train came into contact with a CSX freight train early Sunday morning in Cayce, S.C.
A derailed Amtrak train sits on the track in Cayce, S.C., on Sunday. The Amtrak passenger train slammed into a freight train parked on a side track killing two Amtrak employees and injuring more than 100 people, authorities said. "The lead engine derailed, as well as some passenger cars," Amtrak said in a statement. The company said about 139 passengers and eight crew members were aboard. Lexington County Coroner Margaret Fisher confirmed two deaths occurred in the Amtrak passenger train in a press conference on Sunday afternoon. The train's engineer, Michael Kempf, 54, of Savannah, Ga., and its conductor, Michael Cella, 36, of Orange Park, Fla., both died. Fisher added that given the size of the trains and the number of passengers aboard, "We should have had a lot more casualties, but we didn't." More than 100 other passengers were harmed in the crash, with injuries ranging from minor cuts to broken bones. Five thousand gallons of fuel also spilled in the collision. Hazmat teams were dispatched, and the fuel is not thought to be a danger, according to Lexington County authorities. The freight train was stationary, said South Carolina Gov. Henry McMaster at a press conference. "It appears that Amtrak was on the wrong track," he said. The National Transportation Safety Board says it will conduct an investigation into the collision. The collision came less than a week after at least one person died when an Amtrak train carrying members of Congress hit a garbage truck near Charlottesville, Va. In December, an Amtrak train derailed in Washington state, leaving three people dead and dozens injured. Officials said it was traveling at 80 mph in a 30 mph zone. Deputy White House Press Secretary Lindsay Walters said in a statement Sunday morning that President Trump had been briefed on the incident. "My thoughts and prayers are with all of the victims involved in this mornings train collision in South Carolina," Trump tweeted later.